You can embed videos from MLB.com, sure, but apparently that means all of the ones except, you know, the awesome ones. 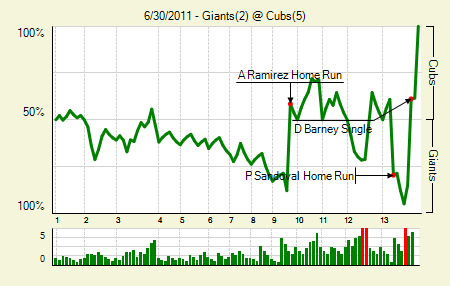 Moving the Needle: Aramis Ramirez homers to tie it in the bottom of the ninth, +.465 WPA. The Giants held a 1-0 lead from the second through the eighth, and handed the ball to Brian Wilsin with just three outs to record. He got the first one easily enough, but on a 3-1 pitch he served Ramirez a succulent cookie. Ramirez obliged by bashing it over the left field wall, tying the game. Three extra frames passed without a run, though the Giants did load up the bases with one out in the 12th. In the 13th they finally re-took the lead with a Pablo Sandoval homer, and then got the first two batters out in the bottom half. But a Jeff Baker double and Darwin Barney single re-tied it, and following an intentional walk Geovany Soto capped the comeback with a three-run shot. Marcos Mateo: 5 IP, 2 H, 0 R, 0 BB, 6 K. That’s some heavy lifting in relief of Carlos Zambrano, who left the game with lower back problems in the second. Matt Cain: 7 IP, 4 H, 0 R, 1 BB, 6 K. He’s gone at least seven and allowed zero or one run in four of his last five starts. It’s always a shame when the bullpen can’t hold a game like this. Moving the Needle: Tony Cruz singles home the first run, +.145 WPA. In a high-scoring game it’s often the first run that swings it is the greatest. Yet that would miss the story of this game. The Cardinals rocked Brian Matusz, who was optioned to AAA after the game, for eight runs in 3.1 innings, the big blow coming on Jon Jay’s three-run shot that ended Matusz’s night. The Orioles then proceeded to make it a game, getting a three-run homer in the bottom of the fourth from Nolan Reimold and then a two-run shot by Mark Reynolds. That, however, was as close as they’d get. Lance Berkman led off the seventh with his second homer of the day, and while the Orioles did get another run in the eighth, that’s where it would stop. David Freese and Tony Cruz: both 2 for 4, 1 2B. 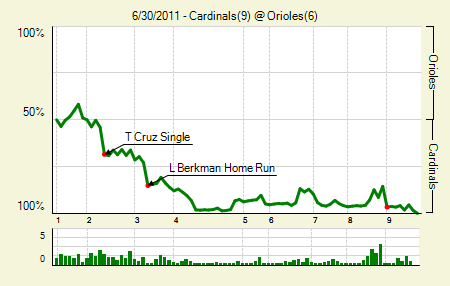 Freese scored a run, while Cruz scored and drove one in. Robert Andino: 3 for 4. Ahead of him both Reynolds and Reimold went 2 for 4 with a homer, making the bottom third 7 for 12. But no one managed to drive in poor Andino any of the times he was on base. Moving the Needle: Ramon Santiago drives in one, and gets another, with a single, +.172 WPA. 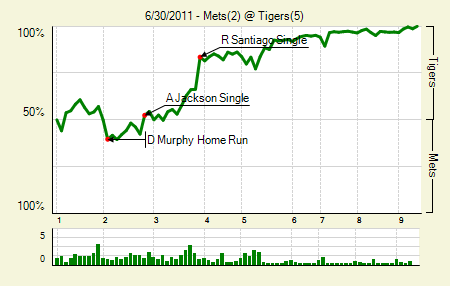 After a pair of high-scoring games, particularly on the Mets part, the series finale was a bit more subdued. They were tied at one in the bottom of the third when the Tigers made their move. A double, single, and walk loaded the bases, and Alex Avila gave them a lead with a sac fly. Santiago followed that up with a single to center to score another, and the runner from first scored when Angel Pagan threw way wide of third. The miscue made it 4-1 and gave the Tigers plenty of cushion. Justin Verlander: 7 IP, 7 H, 1 R, 2 BB, 6 K. When you get shellacked in the first two games of the series, there aren’t many better guys to have on the mound. Andy Dirks: 2 for 3, 1 HR. When the Mets came through with a run, he answered it with a solo shot. Moving the Needle: Gordon Beckham gets them close in the eighth and Juan Pierre puts them ahead in extras, +.218 WPA each. 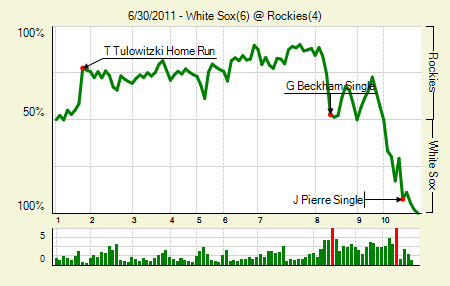 A three-run homer by Troy Tulowitzki in the first put the White Sox behind early, but they fought back. A wild pitch with the bases loaded made it 3-1, and after the Rockies put a fourth run on the board the Sox answered immediately. That takes us to the bottom of the eighth, when three straight singles, the last by Beckham, made it a 4-3 game. Two batters later Pierre hit a sac fly to tie it and eventually send it to extras. In the top of the 10th the Sox loaded up the bases on a double, a single (that didn’t advance the runner) and a sac bunt that the Rockies botched. That brought Pierre to the plate, and he launched one off the scoreboard in right, scoring two runs. It was Pierre’s third hit of the night. Gordon Beckham: 3 for 3, 1 HR, 1 BB. That’s his first extra base hit since June 15th. Moving the Needle: Robinson Cano doubles home the first two runs, +.104 WPA. The Yankees got started early in pursuit of their series sweep. The first two batters of the first walked and then took second and third on a double steal. 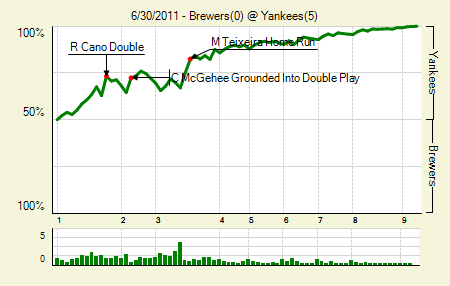 Cano came to the plate with one out, and he took one the opposite way for a double that easily scored both runners. They added two more in the third and then tacked one on in the eighth, but Sabathia rendered that mostly unnecessary. CC Sabathia: 7.2 IP, 6 H, 0 R, 2 BB, 13 K. That’s his first game this season with double-digit strikeouts. He did that only once last year, on July 6th. The last time he struck out 13 in a game was September 14th, 2007, during the stretch run of his Cy Young campaign. Mark Teixeira: 1 for 4, 1 HR. That was No. 300 for his career. Moving the Needle: Carlos Lee homers, +.142 WPA. After playing three and a half scoreless innings, Carlos Lee broke the fast with a homer to lead off the fourth. The homer might have moved the needle the furthest, but the Astros really made their move in the fifth, when they put four runs on the board. 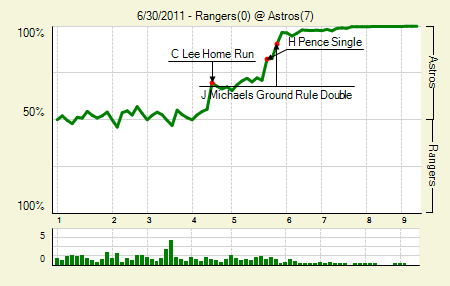 For some reason the Rangers intentionally walked Lee with two outs in the inning. Anyone want to explain that one to me? If they did it because of the homer, well, can’t say that amounts to a good move. At all. Wandy Rodriguez: 7 IP, 4 H, 0 R, 3 BB, 4 K. He generally hasn’t been good against interleague opponents, but he had little trouble with the Rangers. Jason Michaels: 2 for 4, 1 HR. He drove in three runs and scored two. 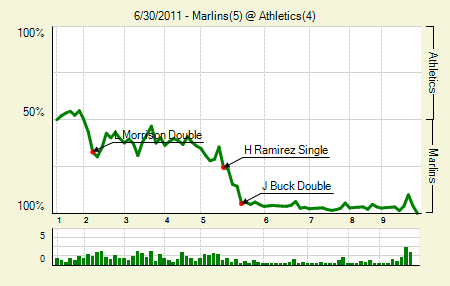 Moving the Needle: Hanley Ramirez knocks home the second run, +.110 WPA. It really wasn’t much, just a chopper down the third base line. But it was slow enough that he’d surely reach safely, which meant that the runner from third would score, too. Because there were two outs it got a little WPA bump. That actually started a two-out rally, and the Marlins tacked on another three after that, which gave them enough to fend off the A’s efforts to take the game in the final three innings. Kurt Suzuki: 2 for 4, 1 HR. His two-run homer in the ninth got the A’s to within one, but they couldn’t pull any closer than that. Chris Volstad: 7 IP, 7 H, 1 R, 2 BB, 0 K. Here’s a good way to describe Volstad’s season. In his last three starts he’s gone 20.2 IP, 18 H, 4 R, 3 ER, 6 BB, 6 K, and his ERA is still above 5.00. xFIP is his only savior right now (3.76, against a FIP almost a full run higher). Logan Morrison: 2 for 4, 1 2B. They didn’t give him an RBI when he hit a double with Hanley on second. It’s not as egregious a robbery as it sounds — watch the replay — but it just seems odd. He did drive in Hanley later in the game. Moving the Needle: Jacoby Ellsbury widens the lead with an RBI single, +.110 WPA. The Red Sox managed to avoid the sweep against the Phillies, though it came with a little help. Cole Hamels took a line drive off the hand and had to the leave the game after pitching four scoreless innings. That left David Herndon to suppress the Sox offense, and it’s understandable that he couldn’t. The Sox struck right away, getting a triple and then a single. Two batters later Ellsbury singled home the second run to give the Sox a slightly larger lead. They got three more later in the game on solo homers. Jon Lester: 7 IP, 2 H, 0 R, 2 BB, 5 K. Those numbers don’t make it appear like a 120-pitch appearances, but that’s how many Lester threw. 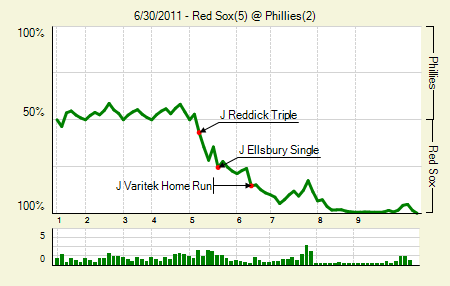 Jason Varitek: 2 for 4, 2 HR. Those were his fourth and fifth homers of the year, after hitting seven last year. He actually has more PA this year, and just one fewer game played. Josh Reddick, Drew Sutton, and Marco Scutaro: all 2 for 4. Reddick tripled. That’s quite a performance from the bottom of the Sox order. Moving the Needle: Yunel Escobar homers to tie the game, +.155 WPA. 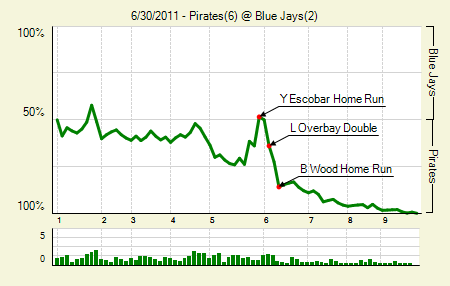 The Pirates took a 2-0 lead by the end of four and a half, but it took the Jays just a half inning to tie it up. Both J.P Arencibia and Escobar homered in the inning. But the Pirates immediately retook the lead on a pair of doubles and a homer to lead off the sixth. They added another in the seventh for good measure. Alex Presley: 1 for 3, 1 3B, 1 BB. He opened the game with a triple, and then drove in a run later with a sac fly. Brandon Wood: 1 for 4, 1 HR. His homer put the Pirates ahead by three. He’s having a terrible season still, but, uh, his strikeout rate is down. Sorry, trying to find a silver lining for this most definitely busted prospect. Jeff Karstens: 7 IP, 5 H, 2 R, 1 BB, 2 K. The only two runs were the solo shots in the fifth. Other than that, he’s looked like his normal ace self, which is just weird to type, though I’m sure I won’t be typing it for much longer. That doesn’t take away from Karstens’ run, of course. He’s a big part of the Pirates success this season. We hoped you liked reading The Morning After: Game Recaps for June 30th by Joe Pawlikowski! While it was a shame that Wilson gave up that HR to take away the win from Cain, it was a much greater problem that the offense went without a hit for over 10 innings against the Cubs bullpen. When the opposing team’s starter gets removed in the 2nd, the team should score more than one run. The Giants need offensive help.